My dining room is a happy spot in my home for me. Besides the most obvious reasons of all the family time spent here, another reason is because I’ve decorated it with colors that brighten my mood. And another reason is that I don’t keep very much in here, so it is very easy to maintain. Right next to the table is my china cabinet. This beauty wasn’t always my favorite thing. I purchased this off Amazon almost 5 years ago. It was inexpensive, put-together-yourself furniture. I like how it fits the space and I like the functionality of a few cabinets and drawers, but it looked blah. So even though it worked well, I found myself wanting something different anyway. Last year, I gave it a coat of chalk paint and new knobs and it feels like a whole new cabinet. I love it so much now! 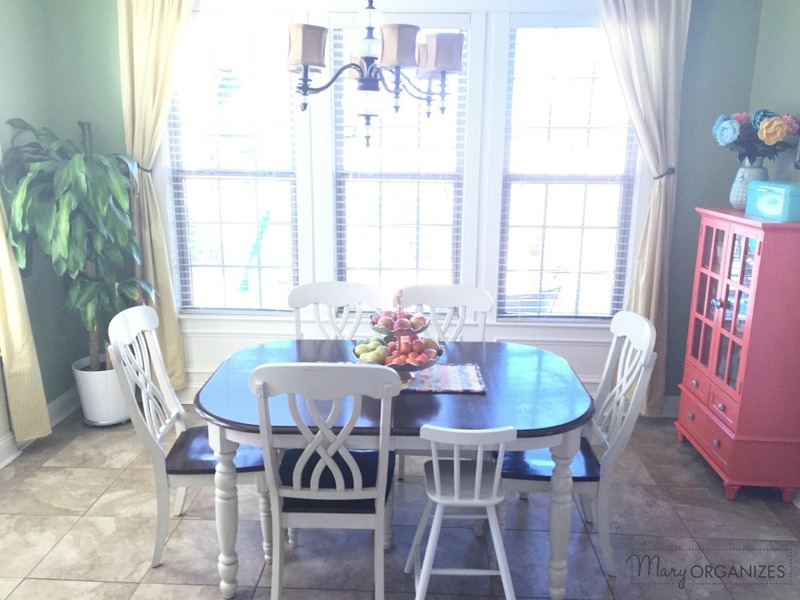 It is crazy what a little coat of paint can do to revive tired furniture. On the other side of my table is my attempt at a large house plant. 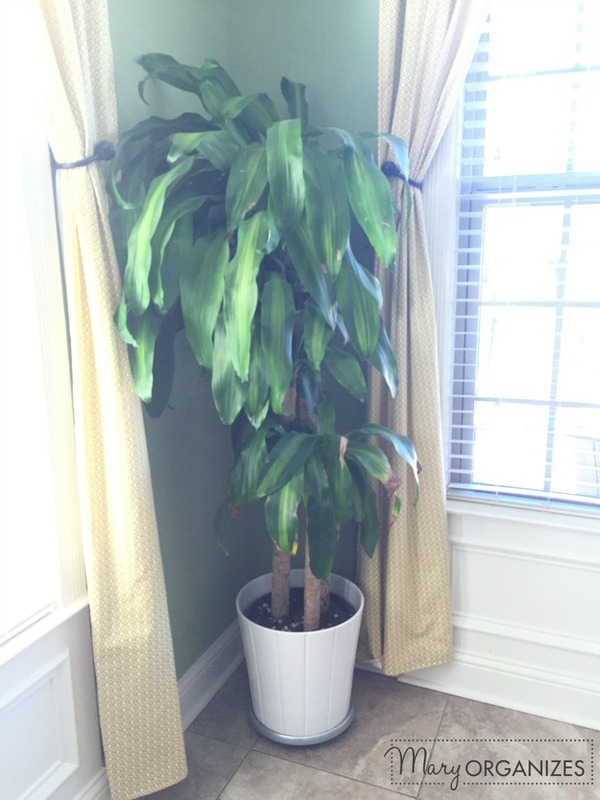 I’ve never done an actual large alive plant before I purchased this one last year. I’ve done okay with keeping it alive, but I seem to either over-water it or under-water it. I’ve not figured out the just-right thing yet, as you can see by some dead leaves. There is always something to learn. I change out my table centerpiece a few times a year. I think it is such an easy way to give the whole room a fresh feel. I will just rotate things around in my kitchen, so I don’t necessarily need to buy something. Sometimes my fruit is up on the counter, sometimes it is on the table, sometimes the flowers are on the cabinet, and sometimes the table, or whatever … you get it. Change is good. The cloth underneath the tiered tray is a little runner I sewed to enjoy some fun fabric. Right now I have some fabric sitting next to my sewing machine ready to make a cute little Valentine’s Day runner. The garbage can is also near the table. I know people have all sorts of preferences for garbage cans, but I like mine by the table for a few reasons. (1) When we are clearing the table, my kids can clear their plates into the trash before heading straight to the dishwasher. (2) When my kids are eating a snack or treat, wrappers are more likely to end up in the trash. 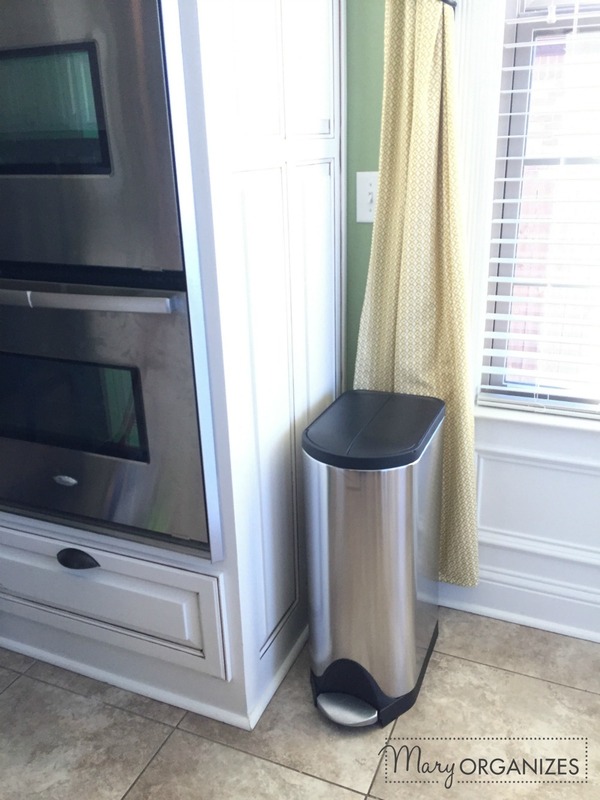 (3) Hiding the trash can seems kind of pointless since everyone I know has a trash can. And when I’m at someone’s house and have to hunt for their trash, it can get awkward. Did you notice something fun about the chairs at my table? There are six family members (2 adults, 4 kids) and six chairs. One chair, however, is definitely different from the others. I found a little child’s seat from IKEA for my son and he loves it. He gets to sit up at the table like everyone else without a bunch of bulky plastic stuff and it is awesome. 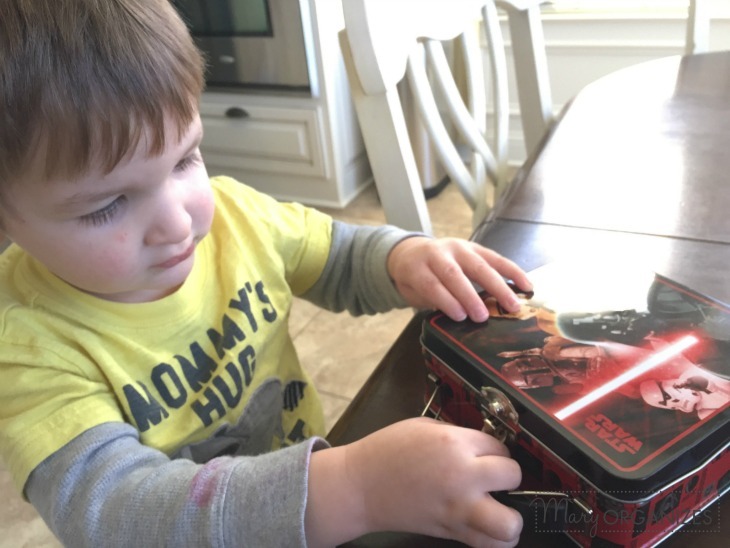 Speaking of that cute little guy, he was off collecting things in his Star Wars box while I took pictures and I stopped taking pictures when he came back to show me what was in his box. Spoiler alert: he found some stickers, which we promptly started putting on our faces and arms. I hope you’re working on your dining rooms this week with a vision in mind of the kind of dining room you’d like to have, and especially of the kind of time you’d like to have there. Maybe a bright coral cabinet isn’t for you, but what will your thing be? Our dinning room has been completed for today! I didn’t think it needed to be done but I’m so glad I did! I’m wondering where did you find your table and other chairs? I have a similar set and need new chairs. Or do you have any suggestions on good places to find chairs? 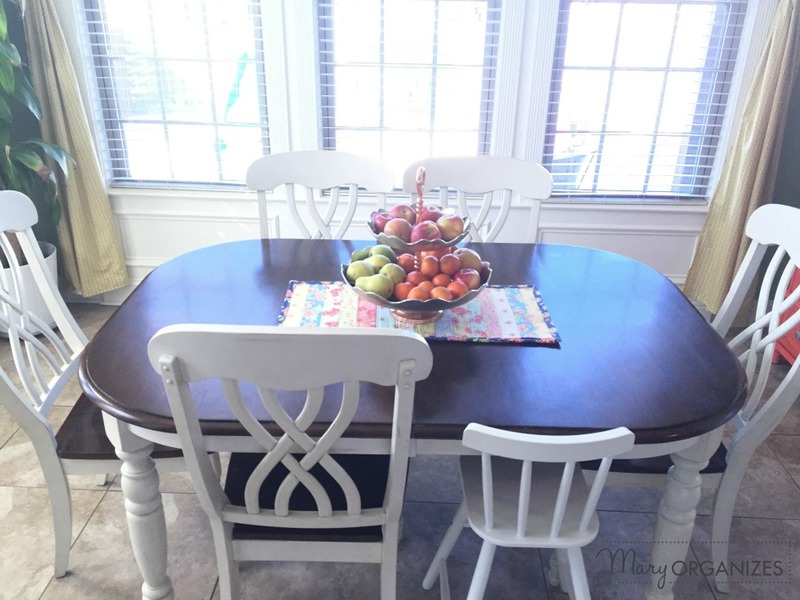 Julie if you Google the word “Ohana Dining set” you will find this table and chair on a number of sites. The chairs come in a two pack on some sites. I have had the set with 6 chairs and the china cabinet for a few years. If you’ve got the energy and the fire burning to do it, then by all means, do it! I’m a little slow, but I just finished my laundry room/pantry yesterday. We got rid of so much stuff and I was actually sad that I didn’t have any laundry left to do. Can’t wait to get started on the kitchen. That is great! I bet it feels good in there! I look at all the stuff leaving as such weight being lifted! I like your refreshing dining room. Our “dining room” is used for other things besides dining. I like that the table we have has drop sides and leaves. The table is currently not in use, so I took the Christmas tablecloth off and updated the decor on it for winter/valentines day. I like the pop of color I can add to the room that is visible when you enter the house. It draws the eye away from whatever toys/books may have been recently used and left out in the room. 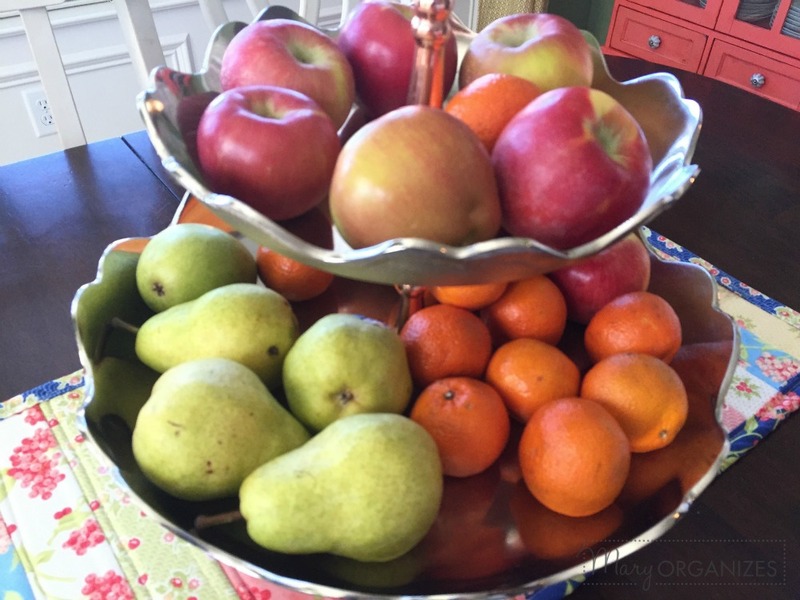 Wondering if the tiered fruit bowl is still available somewhere? I’d love to have one like it. And since I’m fairly “local” to you, I thought I’d ask.Thanks. This one came from HomeGoods. They always have some beautiful tiered stand that calls to me. I usually can be strong and resist, but this one was just too pretty and I knew it would hold my fruit really well. I use a vintage glass one. Antique shops have some great ones. I love your coral cabinet!! We are planning on renewing all of the rooms in our house, one at a time. I have a sketch book where I draw pictures of what I want, glue in paint chips and pictures of rooms I like, and I write what I like about them. Our dining room is now a drab beige (the color it was when we moved in). I picked 3 shades of blue to go on the walls and ceiling, along with white trim. AND I glued in a picture of a RED cabinet similar to yours, where we’ll keep the daily dishes and utensils, making it easy for the little kids to set the table.. It is going to be beautiful! YES! We recently moved into this house, after living in our first home for 14 years. We did improve many things while we were there, but many things were left unfixed until it was time to sell the house. We finally replaced the broken tub, painted and added a new rail to the porch, etc. They needed to be done in order to sell, but I kept wondering to myself, “Why was it ok for us to live with broken stuff?” Well, in our new house, I am determined to “stage” it beautifully FOR US, not the next owners! Yes, I agree! I think you might as well do the fixes while you live in the house and can enjoy them because you’re forced to do them if you ever sell anyway! I love your colors. It’s all so cheerful. Thank you! I need cheerful, especially with this bitter-feeling winter outside! Hi there! 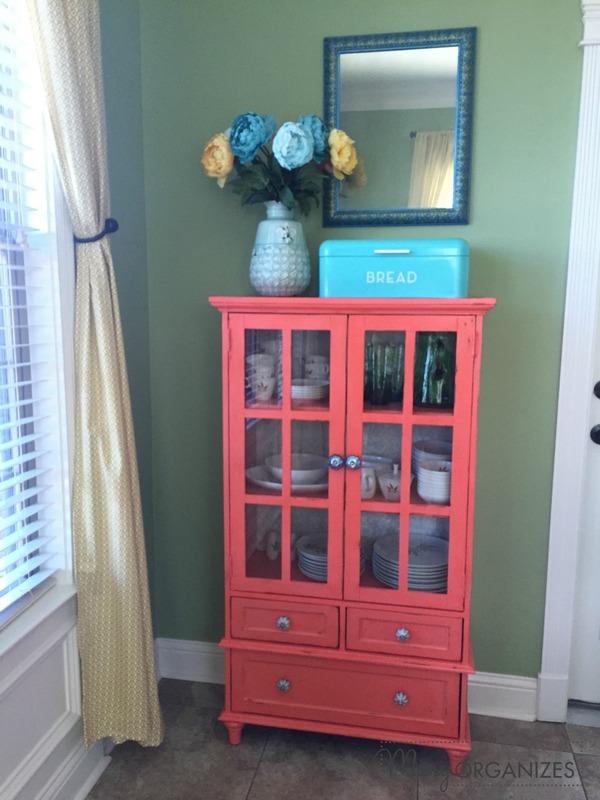 Love, love, love the coral cabinet! Is it still available? You bought on Amazon? Thanks! I bought it a plain wood-color and chalk painted it coral. I bought it almost 5 years ago, I’m not sure if it is available or not anymore, sorry! I’ve pulled out 10 boxes of excess out of my kitchen and dining room cupboards. It was getting hazardous to open some doors. Feels great! That is fantastic!!! I bet it makes such a huge difference – good job! !